At K 2013, KEIMEI Plastifizierung Technik GmbH (www.keimei.de) will introduce their range of high efficiency triple and twin screw extruders as well as their versatile system of blend reactors for challenging applications. 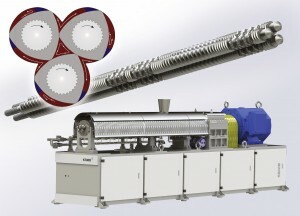 These systems are all equipped with a unique tree-start screw design, which provides an optimized balance between plasticizing effect, output and energy consumption. Compared to conventional two-start screw designs, the input of shearing energy into the processed polymer materials is 50 % higher per revolution of the screw, significantly boosting the mixing and shearing efficiency. All KEIMEI extruder systems are available in two basic sizes with screw diameters of 52,9 or 66,5 mm respectively and L/D ratios from 30 to 60 (20 to 60 for the triple screw type). KEIMEI’s innovative triple screw extruder design provides specific advantages. Not only are the processed materials sheared three times per screw revolution, the trefoil formation also provides three cutting points between these three screws in the barrel, compared to only one in a conventional twin screw extruder. 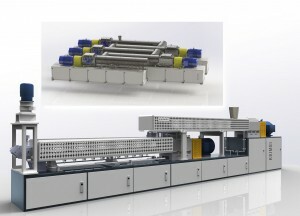 In-house tests prove that, thanks to the combined effects of three-start screw and the use of the triple screw design, the L/D ratio of these KEIMEI systems can be reduced to only one third of that required for a comparable standard twin screw extruder design to achieve the same plasticizing effect. Hence, also the retention time of the material inside the barrel is just one third, which makes KEIMEI triple screw extruders an unmatched choice for the processing of heat sensitive polymer materials. Beyond this, these versatile systems are particularly advantageous for polymer blending and grafting, compounding and dispersing of powder and polymer additives, and also for the continuous mastication of rubber. The range of KEIMEI blend reactors is as diversified as the materials and tasks they are used for. Basically, they are all built up by a series of twin screw extruders and their related control devices, with the number of extruders determined according to the requirement. 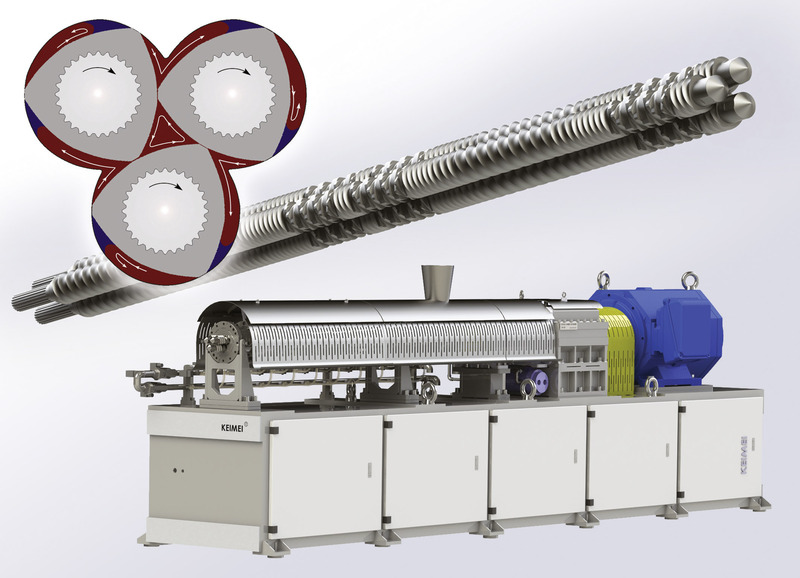 Increasing the efficiency of a twin screw reactive extruder commonly involves higher L/D ratios, which in turn require higher input torque to meet the specified revolution speed. This approach is limited by the torsional strength of the screw core shaft. The cascaded design of KEIMEI multiple stage blend reactors overcomes this constraint, as the individual systems can be kept short and at the same time highly efficient, making the total achievable L/D ratio virtually unlimited. The typical applications of these tailor made systems range from polymer synthesis reactions and the physical processing of special polymers, such as the preparation of polymer-based nano-composite materials, to the dissolution of polymers in ionic solvents as well as in critical gases, to polymer degradation reactions, etc.